I’m not sure I’d say it’s a mistake how target date funds are constructed. But I absolutely agree that there’s more to risk tolerance and asset allocation than just the year in which you plan to retire. For example, how stable is your income? A person with a secure, steady-paying job can take on more risk than a person with a job that could be lost at any minute or a person with a job that pays entirely based on commission. What other assets do you have? If you have a very large emergency fund that you’re not counting as part of your portfolio, you can take on more risk in the portfolio than somebody with a smaller emergency fund. What other assets would you have access to, if the need arose? Consider two young investors. One comes from a poor family and knows with 100% certainty that she wouldn’t be able to get any sort of financial assistance from friends or family if she lost her job. The other comes from an upper middle class background and knows that the Bank of Mom and Dad would chip in (at least to some extent) if a financial emergency came up. All else being equal, these two investors have very different levels of risk tolerance. How much investing experience do you have? Have you been through a bear market before? Until you’ve experienced one, you should assume that it will feel worse than you’d naturally expect. If your portfolio is small relative to the size of your total available assets and you can therefore afford to make a mistake (e.g., sell out at or near the bottom in the event that you can’t handle the stress), then go ahead and build a high-risk portfolio. But if selling out would be a problem and you’ve never been through a bear market, you should probably consider a less risky allocation. Due to all of the above factors, an investor might want an allocation that doesn’t vary solely with age. For example, for a young investor who has a relatively low risk tolerance and who doesn’t expect that risk tolerance to change any time soon, a fixed 60% stock, 40% bond allocation may be a good fit. But the Target Retirement funds don’t offer that option. For investors who want an allocation that doesn’t vary with age, and who still want the simplicity of an all-in-one fund, Vanguard’s LifeStrategy funds can be a good fit. Administrative note: My wife and I are moving this week, from St. Louis, Missouri to Manitou Springs, Colorado. As a result, there will be no articles this upcoming Friday (6/20) or Monday (6/23). Also, please be patient with me if I’m slower than usual in replying to emails. You plan to take the money early and invest it in risky assets, you understand that there’s a significant possibility that you’ll end up worse-off as a result of that decision, and you can afford such an unfavorable outcome. You want to leave behind money to your kids. One way to assess the when-to-claim decision is to calculate the break-even point between two different strategies. For example, how long do you have to live for claiming at 70 to be a better strategy than claiming at age 62? As it turns out, if inflation-adjusted interest rates are below 2% or so, the break-even point occurs prior to age 83 (age 83 being the total life expectancy for an average 62-year-old). Stated differently, unless investors can safely earn inflation-adjusted investment returns of 2% or more (not possible at the moment, given current TIPS yields), most people (specifically, most unmarried people and higher earners in married couples) can maximize the total number of dollars they’ll have available to them over their lifetimes by claiming Social Security at 70 rather than at 62. The key insight here is that maximizing the total dollars you have available to you over your lifetime isn’t the same thing as maximizing your standard of living in late retirement only. If you prefer, you can use that increased amount of lifetime wealth to spend more in early retirement. Or, if you prefer, you can simply accumulate those dollars and leave them to your heirs. 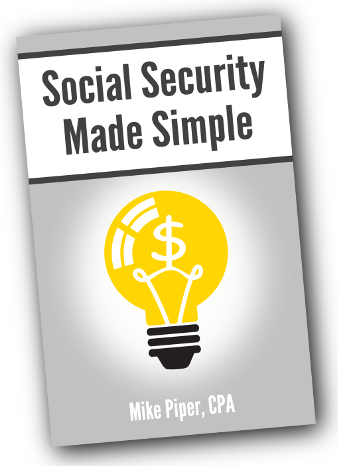 …there’s still a good chance that delaying Social Security until 70 is the best strategy. This week, a reader wrote in asking about the Vanguard Global Minimum Volatility Fund that was launched in December 2013 — what it’s supposed to do, what it owns, and so on. The fund is an actively managed stock fund. The fund’s investment strategy is to select stocks based on their individual volatility levels and correlation to each other, with the goal of delivering less overall volatility than a typical indexed stock portfolio. Vanguard has stated that the plan is for the fund to have roughly half of its assets in U.S. stocks, and half in international stocks. And indeed, the fund currently has an allocation very close to that target. The Global Minimum Volatility fund currently holds 241 stocks. While that’s not exactly a small number, it’s still far fewer than would be included in a typical broadly diversified index fund. For instance, a combination of Vanguard Total Stock Market Index Fund and Vanguard Total International Stock Index Fund would currently include more than 9,000 stocks. How Risky is the Fund? The fund has an expense ratio of 0.30% (or 0.20% for Admiral shares, with a $50,000 minimum). There’s no ETF version of the fund. Given that we continue to be very happy with our simple one-fund solution, we won’t be adding the Global Minimum Volatility Fund to our portfolio. But, frankly, even if we weren’t using an all-in-one fund, I still wouldn’t be inclined to add this fund to our portfolio, due to my general degree of pessimism about the value of active management. If I wanted to slightly reduce the risk level of my portfolio, I would simply adjust my stock/bond allocation slightly rather than moving a portion of my stock holdings into an actively managed stock fund that hopes to achieve lower levels of volatility than basic stock index funds. That said, if I ever were to place a bet on active management, I would want to find a fund with rock-bottom costs, so as to minimize the hurdle that the fund managers have to overcome. And the cost of active management for this fund is much lower than that of most actively managed stock funds. My apologies for the unusual Wednesday post. 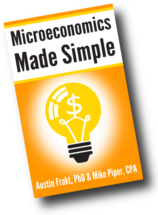 I just wanted to give readers a brief reminder that today is the last day to download a Kindle copy of the new book, Microeconomics Made Simple, for just $0.99. Also, if you’d like to tell any friends about the book (e.g., via forums, Facebook, or Twitter), today would be the day to do it, so that they can get the lower price as well. We’ll return to our regularly scheduled investing-related material on Friday. 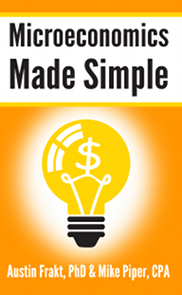 Of my books, the one that sells the most copies each month is the one that has the least to do with personal finance: Accounting Made Simple. I wrote the book with small business owners in mind, but it has turned out to be very popular with business students who are struggling in their accounting courses. 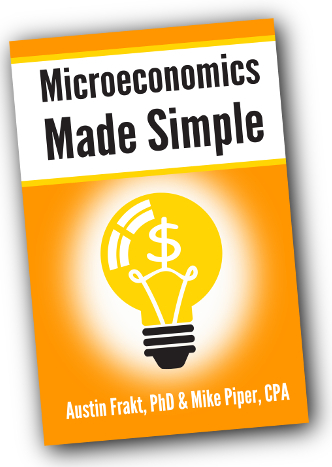 Over the last few years, many readers of that book have asked whether I would consider writing a similar book about microeconomics. While that seemed like a great idea, there was one obvious problem: I’m not an economist. My training in economics consists of just a handful of undergraduate classes. You find yourself puzzled by some discussions of markets, profits, opportunity cost, or other microeconomic concepts and want a way to get up to speed. 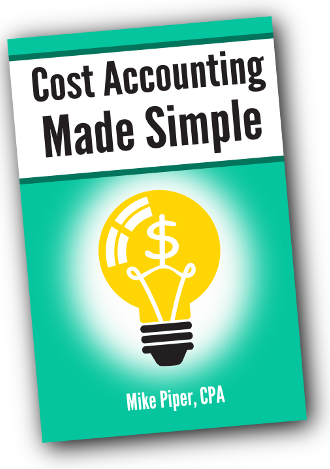 Also, for anybody interested, the Kindle version of Accounting Made Simple will be discounted as well during that same period. This book is in two parts. In Part One, we discuss several of the most basic concepts of economics, such as utility, supply, demand, market equilibrium, and some ways in which governments intervene in markets. In Part Two, we focus on the degree of competition in different types of markets, as well as the outcome of that competition. Market structures considered include: perfect competition, monopolies, oligopolies, and monopolistic competition. A detailed chapter-by-chapter table of contents is available on Amazon. To give a good sampling, these excerpts come from both earlier and later sections in the book. Naturally, the topics are somewhat easier to understand within the full context of the book. PS: Special thanks go to Wade Pfau and Julian Jamison for contributing their time and expertise for technical editing. The following is an adapted excerpt from my book Microeconomics Made Simple: Basic Microeconomic Principles Explained in 100 Pages or Less. “Consumer surplus” refers to the value that consumers derive from purchasing a good. For example, if you would be willing to spend $10 on a good, but you are able to purchase it for just $7, your consumer surplus from the transaction is $3. You’re getting $3 more value from the good than it cost you. We can use a chart of supply and demand to show consumer surplus in a market. EXAMPLE: The following chart shows the perfectly competitive market for oranges. The market is in equilibrium at the price PE and the quantity QE. As we know, the demand curve indicates consumers’ willingness to pay. In the chart, the amount that consumers actually are paying is PE — the equilibrium market price for oranges. Therefore, for each transaction that occurs up to QE, consumer surplus is achieved in an amount equal to the distance between the demand curve and PE. As a result, the shaded area in the chart indicates the total consumer surplus achieved in the orange market. To calculate the total consumer surplus achieved in the market, we would want to calculate the area of the shaded grey triangle. If you think back to geometry class, you will recall that the formula for area of a triangle is ½ x base x height. In this case, the base of the triangle is the equilibrium quantity (QE). And the height of the triangle is the amount by which the y-intercept of the demand curve (i.e., the price at which quantity demanded is zero) exceeds the equilibrium price (PE). “Producer surplus” refers to the value that producers derive from transactions. For example, if a producer would be willing to sell a good for $4, but he is able to sell it for $10, he achieves producer surplus of $6. 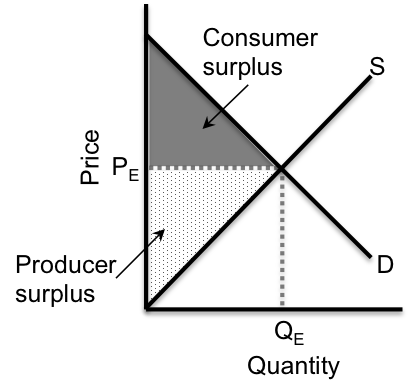 Like consumer surplus, producer surplus can also be shown via a chart of supply and demand. This time, however, the surplus from each transaction is represented by the distance between the supply curve (which denotes the lowest price suppliers would be willing to accept) and the market price. The total producer surplus achieved in the orange market would be represented by the dotted area in the chart. The area of the dotted triangle (representing producer surplus) is calculated as ½ x base x height, with the base of the triangle being the equilibrium quantity (QE) and the height being the equilibrium price (PE). “Total surplus” refers to the sum of consumer surplus and producer surplus. Total surplus is maximized in perfect competition because free-market equilibrium is reached. That is, if a quantity less than the free-market equilibrium quantity were transacted, total surplus would be less, because there would be beneficial transactions that are failing to occur (i.e., transactions where consumers’ willingness to pay is greater than the lowest price suppliers are willing to accept). And if a quantity greater than the free-market equilibrium quantity were transacted, total surplus would be less, because transactions that cost more to producers than consumers would be willing to pay would occur.